Thanks for praying about kids connecting! We have seen the group gel today and don't feel like there are as many kids on the fringe. Pray for Matic who is a little different and that we can protect him from getting made fun of. We want every kid to have a great experience. Conversations are already happening about spiritual things and last night, our 18 year old Slovene helper, Anton, put his boys to bed with stories from the Bible. And they loved it! Other spontaneous conversations are happening so pray for the Holy Spirit to be opening up hearts to respond. We played Ultimate Frisbee with an octopus today and Cris got in there and played! Both Shelley and Cris are doing an amazing job teaching and engaging with kids constantly. I am so blessed to have them here. 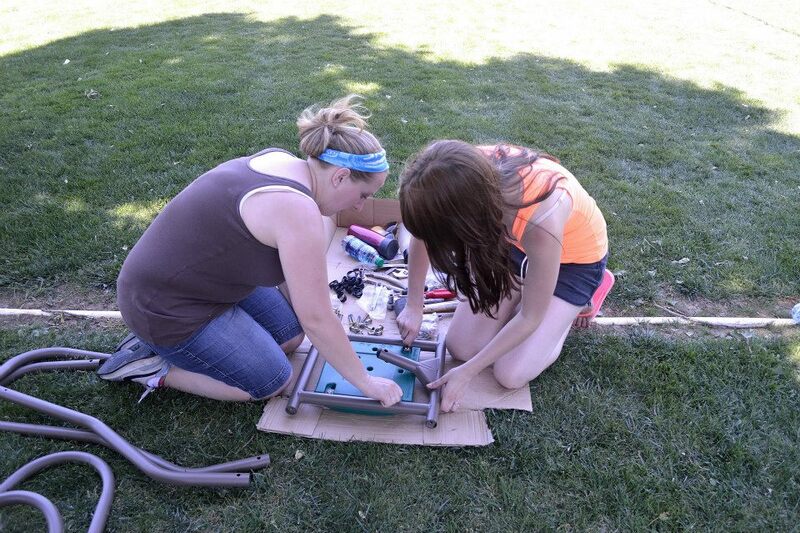 Today we made excellent progress on the play structure assembly and ground preparation. We made a gravel path leading from the house to the play structure. 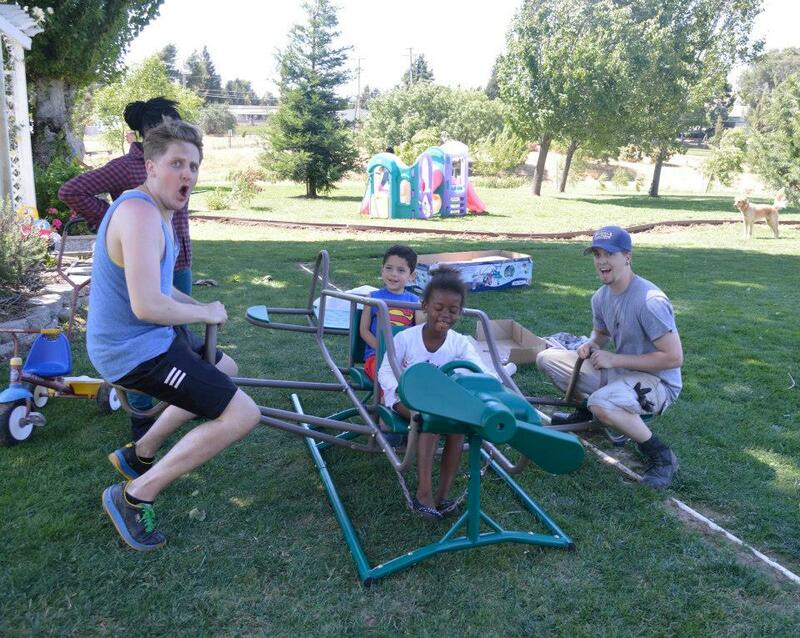 The guys worked with Sandy and a couple other airmen to dig out the area where the play structure will be set up. After a full day of work we ended our evening working The Peak. Please keep two airmen in your prayers: Franklin and Cody. They are new to the air force and new to The Peak. Please pray that our team would make an impact on them, and that they would be able to attend the Bible study on Thursday night. Today was a day of rest for the team. We toured the Jelly Belly Factory in the morning since a few of our team members had never been. The afternoon was spent with one of the regular airmen at the HH, Amir, who gave us a tour of the base and shared his story of salvation with the team. We worked The Peak again Wednesday night. 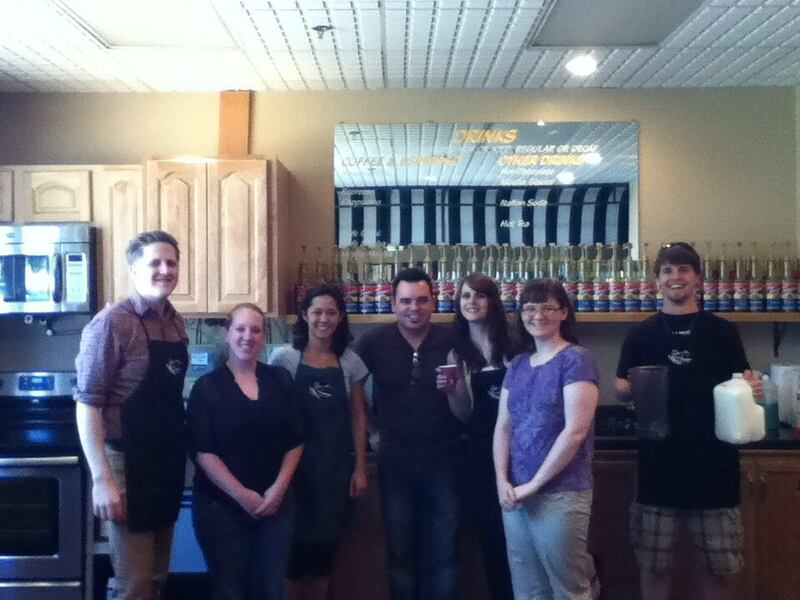 At this point Grant has given us all a thorough training on making drinks! We don’t know what we’d do without his skills. Please continue to pray for Franklin and Cody that they will come to Bible study at The Peak on Thursday. They’ve definitely made a connection with our team. minister to them. Mark led the group in the Bible study. He shared about fathers of faith in the book of Genesis, and the hope we have that God has a plan and used ordinary people, sinners like us, to carry out His plan. Donny closed the evening by sharing his testimony. He talked about the transformation in his life when the Holy Spirit took over, and how the cleansing work of Jesus on the cross is offered to everyone. His story is so powerful and really had an impact on the group. The team arrived safely at the Hospitality House at 4:45pm. Praise God for no complications on the journey down. Sue Nafziger was there to greet us, along with Kendall and a few other airmen. Sandy and several of the regular HH airmen are at a car show in Pismo Beach, due to arrive back on Sunday night. Sue took us to her dadâ€™s house just a few miles away from the HH where we settled in comfortably for the night. We began our day at the First Street Chapel on base for the 9:00am worship service. We saw several familiar faces and made some new introductions. Donny shared during the service about his mom, asking for prayer as she wrestles with her new faith and a husband who does not believe in God. After the service we had lunch with some folks at the food court on base and became more connected with a few airmen who have only been at TAFB for a little while. It's amazing how eager they are to make new relationships, find out where you're from, and how God has been leading in your life. After lunch Sue took the group over to The Peak Cafe to get a feel for the order of operations there. The Peak is a coffee house that is actually a base chapel ministry, operated by the folks of the Hospitality House. 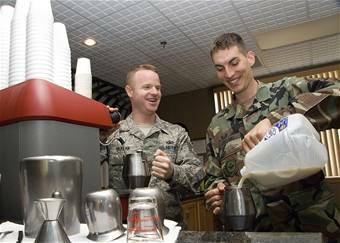 It offers a positive, welcoming environment for anyone on base to come and enjoy a cup of coffee and relax. 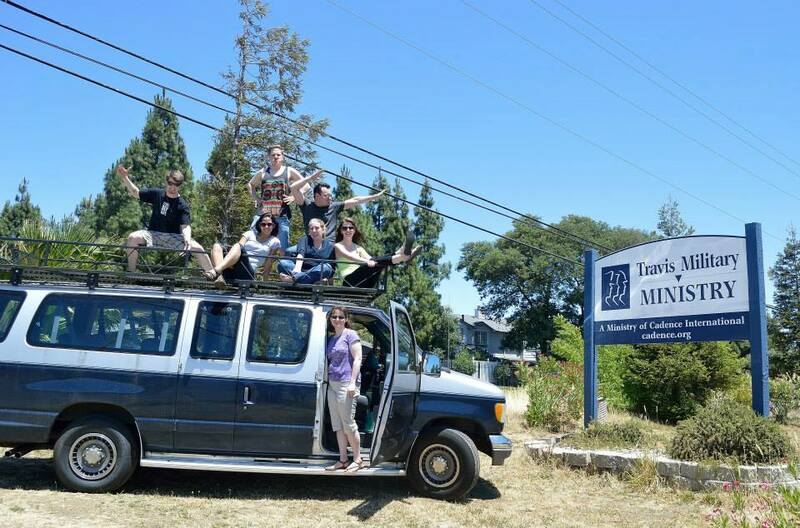 The Nafzigers treat The Peak like they do their own ministry in the Hospitality House. We are due to work The Peak every night we can this week. Grant, our team barista, is really going to come through for us! Sunday afternoon we helped set up the VBS at another chapel on base. Though we are disappointed to not have the privilege of helping at the VBS this year, we are so thankful to have had this opportunity to assist in the set up. It was just another chance to fellowship and serve with the airmen. We woke bright and early and met Sandy at the Hospitality House, where an exciting project was waiting for us! 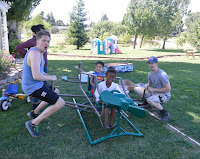 A former chaplain on base donated a brand new play structure to the HH, so the biggest thing we're going to be doing to service the HH this year is preparing the ground and building the play structure. It's going to be a tremendous addition to the HH grounds. Anna and Amanda were able to help with the registration process at the VBS on base this morning, where they checked in about 140 kids! The team made fantastic progress on the play structure today, and fully expect to complete the project by the end of the week. Stephanie cooked a delicious dinner at the HH for everyone tonight. We worked The Peak and met a lot of great people - some fellow believers and some who don't know Jesus. We ended our night with a team debrief/time of prayer for the folks we engaged with that evening.